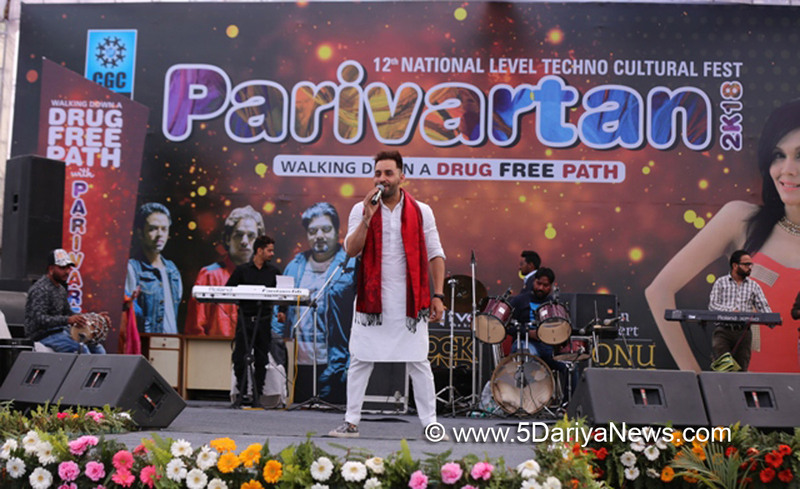 PARIVARTAN 2K18, the 12th national techno cultural fest of Chandigarh Group of Colleges (CGC) Landran concluded today with spellbinding live performances by Punjabi Singer Harf Cheema and Bollywood singer Sonu Kakkar. The second day of the techno cultural extravaganza at CGC, Landran showcased cultural diversity as the students from different colleges and schools performed the folk dances of various states of India. These included the traditional folk dance of Rajasthan, Pahaari Naati- the traditional folk dance of Himachal Pradesh, Folk dance from Jammu and Kashmir and Malwai Giddha from Punjab, in addition to Dances and singing performances in Western song/dance categories.The special highlight of the concluding day’s performances was a thrilling showcase of Gatka performance by students of CGC Landran.The winners of competitions in all categories were felicitated with certificates, trophies and cash prizes.The event saw the participation of more than 30,000 students from various schools and colleges across the country. The fest featured various competitions in technical, non-technical and cultural categories. ‘Walking Down a Drug Free Path’ was the theme for this year’s fest which aimed to spread awareness against drug-abuse and encourage youth to lead a happy and active lifestyle to avoid getting into the lethal trap of drugs.